Ellon florists offer their customers a fabulous array of surprise flowers. Surprise flowers from Ellon Flowers are the perfect way to treat a loved one on a special occasion whether it be a birthday, anniversary or a presentation. The expert florists in Ellon work as part of a network of florists around the world. The florist network consist of professional florists from over 140 countries. As Flowers Ellon work with this network, they can have your surprise flowers delivered to your special someone regardless of where they may be in the world. The flowers used in the surprise flower bouquets are of the finest quality. All flowers are specifically selected and imported from Holland. The surprise flowers are imported from Holland as these are the best flowers in the Netherlands and are the best quality available. All flowers used for the surprise flower bouquets can be credited for their longevity and freshness. 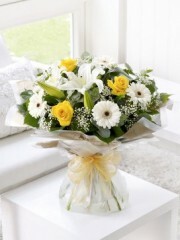 Ellon flowers receive flower deliveries weekly to make sure they are only using the best flowers. All surprise flowers from the expert Ellon florists are hand-tied and treated with the skill and care they deserve. You will not be disappointed with the quality you receive when ordering your surprise flowers from Ellon flower delivery. You can choose from the array of pre-designed surprise flowers available through our online store. Alternatively, you can choose to have a surprise flower bouquet created with your preferences in mind, or allow the expert Ellon florists design something for you. No matter what you decide you can rest assured that you and your recipient will be more than satisfied with your Ellon flower delivery. If you would like to speak to the expert florists in Ellon, have any questions or wish to place an order for surprise flowers, do not hesitate in calling Ellon flower delivery today. Our professional team will do their very best to assist you in any way they can to ensure your experience with Ellon flowers is perfect. Call Ellon flowers on 01358 484 089 today. 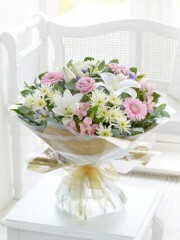 There are a number of flower delivery options to choose from. Ellon flowers deliver surprise flower bouquets Monday to Saturday. The Ellon florists deliver flowers from 9am to 6pm. If you pick the next day delivery option you can have your flowers delivered in the morning or afternoon. The morning time slot is from 9am until 1pm, while the afternoon slot runs from 1pm to 6pm. This delivery options are perfect for ensuring that your surprise flowers are delivered to your special recipient when they are most likely to be available. Furthermore, Ellon flowers offer a premium same day flower delivery service. Providing you place your flower delivery order before 3pm, you can have your surprise flowers delivered on the same day. The Ellon florists need you to place your order before 3pm so that they can ensure the time can be taken so that your loved one receives the best quality flower bouquet.